Matouk's Hot Sauces Hot Sauces- Since 1989! 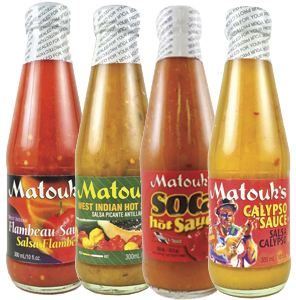 Matouk's Calypso Hot Sauce of one of my favorites due to it's truly unique flavor which is inspired by the rhythm of the Caribbean music. Calypso rhythms can be traced back to the arrival of the first African slaves brought to work in the sugar plantations of Trinidad. Forbidden to talk to each other, and robbed of all links to family and home, the African slaves began to sing songs. They used calypso, which can be traced back to West African kaiso, as a means of communication and to mock the slave masters. These songs helped to unite the slaves and so engrained a rich culture and tradition amongst the people of the Caribbean. 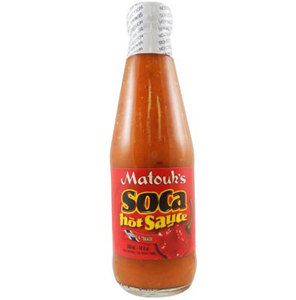 Matouk's Trinidad Scoprion Hot Sauce is made in Trinidad and this is one of the hottest and most flavorful sauces on the market. Matouk's is known for its exceptional quality and they have unleashed this fiery, delicious hot sauce for all of us to enjoy! For a real treat, eat with Mahi Mahi tacos or add to a pizza for a tingling experience! Matouk's West Indian Flambeau Sauce Hot Sauce, from down in Trinidad and Tobago, comes this scorching puree of blazing peppers. The hottest sauce we've found without capsaicin extract added. This tonsil-torcher is made from aged pickled scotch bonnet peppers with mustard. The mustard taste is somewhat muted. A deep orange color, this sauce even looks hot! Good stuff!